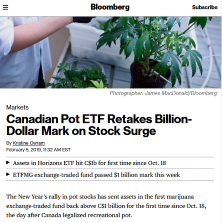 The New Year’s rally in pot stocks has sent assets in the first marijuana exchange-traded fund back above C$1 billion for the first time since Oct. 18, the day after Canada legalized recreational pot. The Horizons Marijuana Life Sciences Index ETF reclaimed the C$1 billion ($761 million) mark on Monday. Assets in the fund had dipped as low as C$624 million on Dec. 21. The Horizons Marijuana ETF, better known by its ticker HMMJ, was the first exchange-traded fund to track the cannabis industry but it’s no longer the biggest. That honor belongs to the U.S.-based ETFMG Alternative Harvest ETF, which surpassed $1 billion in assets this week for the first time. © Zito Partners 2011-2019. All rights reserved.